Scroll down for a description of Pisces Characteristics, and a look at Pisces Symbols. 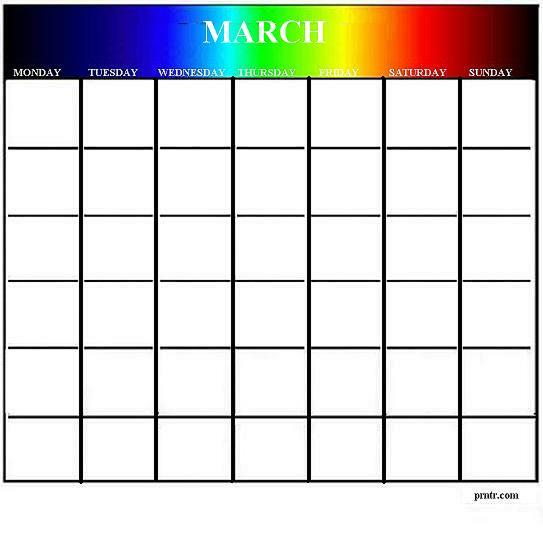 Or print out the March calendar shown above. Pisces is the twelfth astrological sign in the Western Zodiac, which occurs when the sun appears to pass through the constellation of Pisces. This celestial positioning is known to happen every year between the dates of February 19th and March 20th. Those who are born under the sign of Pisces are generally believed to be imaginative people with great sensitivity and keen intuition. In some cases, this can cause them to be introverted and maybe a little on the passive side. Pisces personalities tend to have gentle, patient dispositions. Pisces people are typically compassionate, caring and romantic, but can also be overly idealistic, sometimes exhibiting escapist tendencies. In ancient cultures, March was considered the first month of the year. Bloodstone and Aquamarine are the birthstones represented for the month of March. The two signs of the Western Zodiac that occur in the month of March are Pisces and Aries. The Lakota people used to refer to the month of March the "Moon of Snow Blindness," or "Snowblind Moon." Special days commonly acknowledged during the month of March include the first day of spring, and (in some years) Passover week, Good Friday, and Easter Sunday. To print the March calendar shown above, just right click on the image and select a SAVE option from your drop-down menu. This will send the image to your picture file, from where you can adjust it as needed for best printed results. Use this blank calendar as a template to customize your own personalized calendar designs. For a broad selection of tattoo designs, clip art, poetry, and next month's calendar, click any of the links shown on this page.